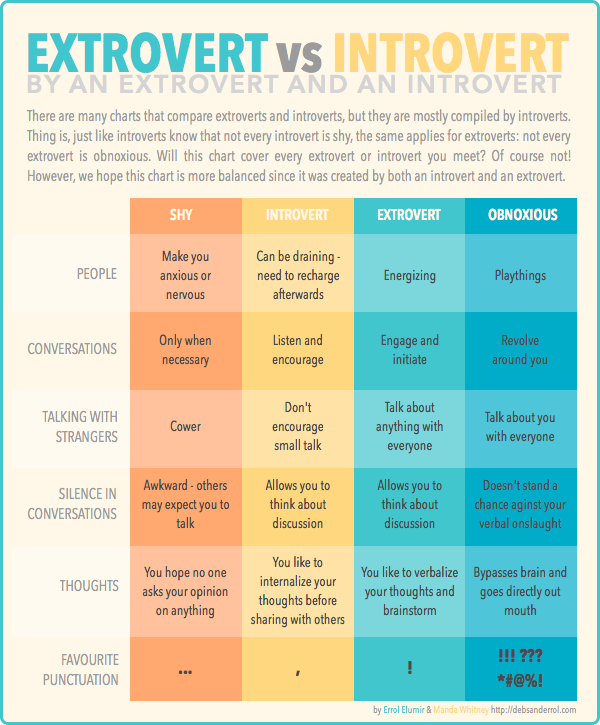 Errol: I ran across another Extrovert vs Introvert chart and once again it pegs extroverts as selfish prats, but cries foul about how not all introverts are shy. I don’t think any of the charts are written with any input by an extrovert. So I found a chart and based this one on it. And then, to be fair, I also asked Manpans, an introvert, to give her input. Thing is, I do know there is a bit of animosity towards extroverts, and hey, I understand why. If you read comments on our How to Care For Introverts video, people are scarred here! I’d say my position tends to float between shy and introverted, though my exact response depends on the situation- and on favourite punctuation, while I’ll admit I do use ellipses quite a bit, I also use most of the other stuff as cirumstances dictate- with the exception of the obnoxious strings of uber-punctuation; those I tend to avoid. Most of the time I’m introverted, but as MP said it depends on the situation. With people I know well (and who are also introverted) someone has to start the conversation so I’ll act a little bit more extroverted, and with a group of extroverts I don’t know in an unfamiliar situation, I’m more on the shy side. As for the punctuation, I like ellipses and commas. I use exclamation marks occasionally, and ?! very occasionally. I generally wander back and forth between intro- and extrovert, but probably with a bit more time spent in the fields of extroversion. Especially if you ask those near and dear to me. And if I’m with a few fellow extroverts, there just might be some mild group forays into obnoxious once in a while. But I love the commas, and ellipses can be quite useful… Not so much a fan of the exclamation points – though they do seem to have a way of popping up on the Internet. The odd thing with me, is I know I’m an introvert, but people all tell me I’m an extrovert. I don’t get it. It takes a lot out of me to do public speaking, and I’m terribly nervous meeting new people. I get told it doesn’t show, and people act shocked when I tell them I see myself as shy and introverted. My dad’s side of the family are all in theater, so I learned how to hide my nerves often, but I still feel them, and sometimes they are debilitating. I spent a lot of time in Junior High sitting under a desk, reading. Me too, Lore. Sometimes after first meeting me people are actually a bit shocked to know I’m an introvert. The acting training sometimes covers up my shyness. Of course once they get to know me it’s really obvious. And that’s pretty much it… if you ask me. An introvert needs to recharge after people. I would have to go with some shy and some introvert in that chart. People make me very anxious, I’m no good at small talk, and silence in conversations make me babble like an idiot. Otherwise, or with people I at least know a little, I’m more introverted than downright shy.